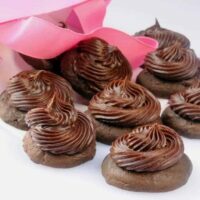 Chocolate-Peanut Butter Pinwheel Cookies combine peanut butter dough with a layer of melted chocolate. 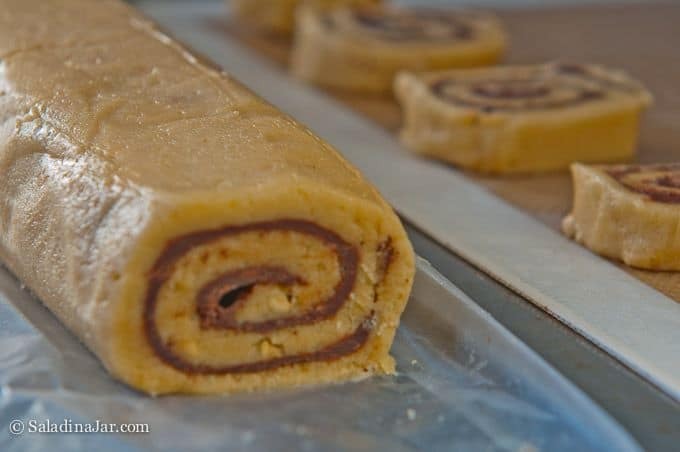 Roll into a jellyroll shape before slicing and baking for a Reese’s Peanut Butter Cup flavor experience in a cookie. See the Scrabble board in the picture above? It’s the same board seen in the picture below. 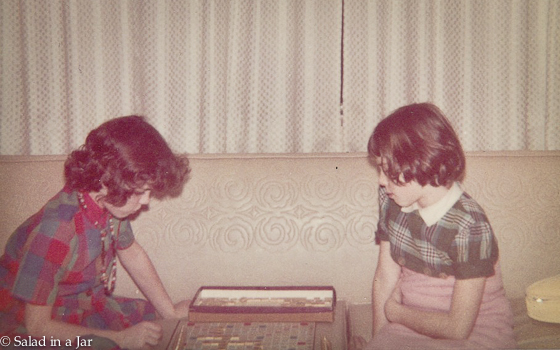 That’s me on the left, playing against my younger sister Bonnie. I think I was around 10 yrs-old, so she would have been about 8. We spent many winter evenings on the farm playing Scrabble since we had no TV. We still play, almost every day, on Words with Friends. Competition is friendly, but we still take satisfaction in the occasional B-I-N-G-O and high score. The recipe for these cookies was printed on an old calendar I’ve kept around for years. They’re fun and tasty when I want something just a bit different. 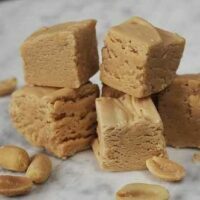 Taste-wise, they remind me of a chocolate chip cookie with peanut butter in it. They speak directly to my frequent craving for Reese’s Peanut Butter Cups. 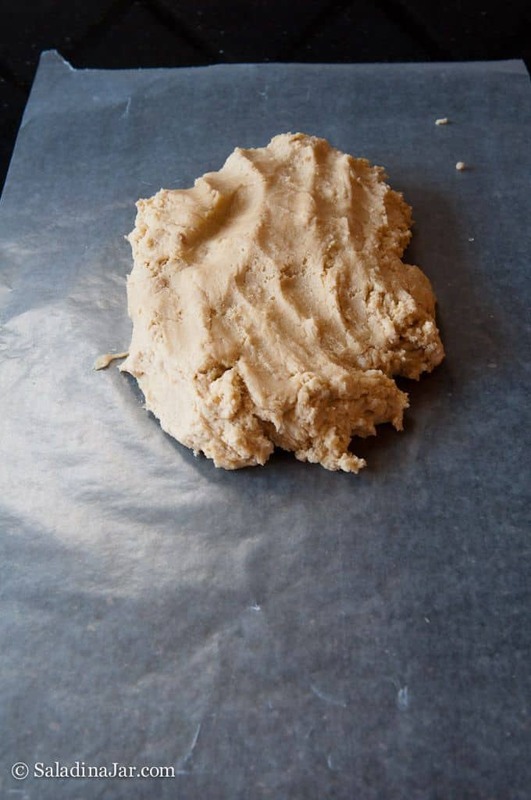 Get started by mixing the dough per the recipe below. 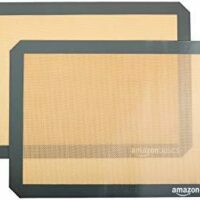 Turn it out onto waxed paper and follow the pictures. Beat butter and sugar until light and fluffy. Blend in peanut butter, milk, vanilla extract, and egg. Stir in flour, salt, and baking soda. Melt chocolate in separate bowl by microwaving for one minute on HIGH. Set aside to cool. 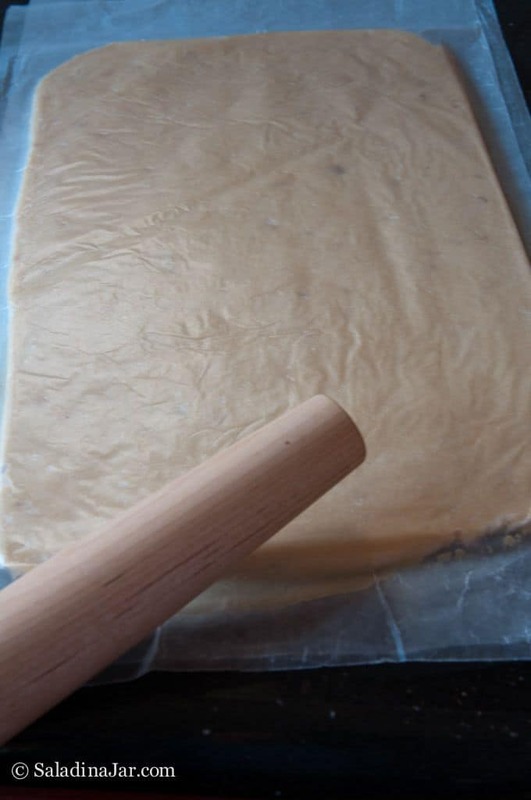 Press dough into a ball and place between two long sheets of waxed paper. Roll out into a 10 x 17 inch rectangle. 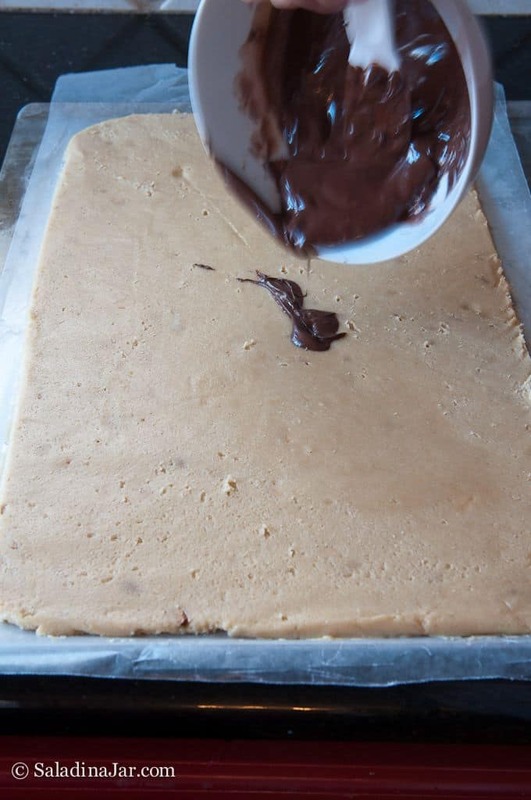 Remove top piece of waxed paper and spread cooled chocolate over the top. 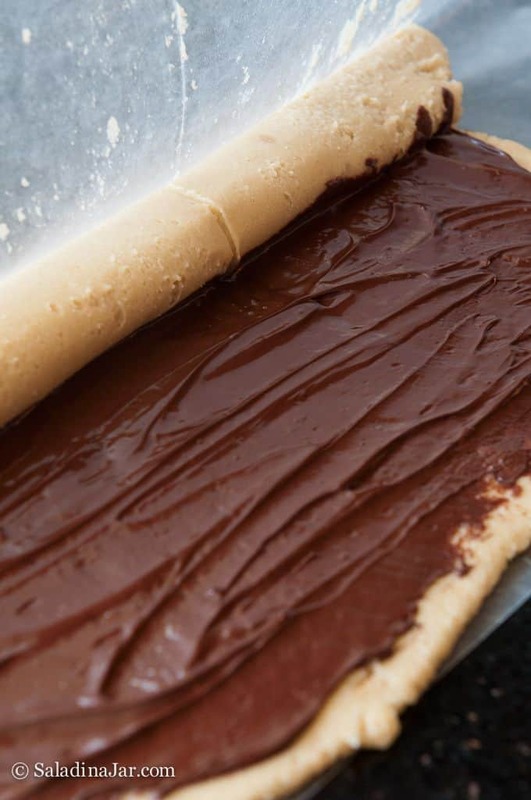 Starting with the long side, roll up dough with chocolate inside. Chill for 30-45 minutes. 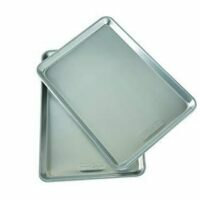 Preheat oven to 375 degrees F. Prepare cookies sheets by covering with a silicone baking mat or parchment paper or by greasing. 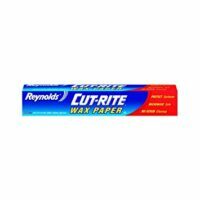 Slice chilled roll 1/4 inch thick and place on prepared cookie sheet. Bake for 10-12 minutes. Move to cooling rack while still warm. 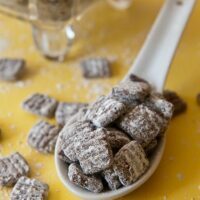 Get your Muddy Buddy fix for fewer calories, less sugar and more fiber. Super easy! 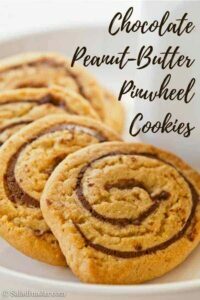 I would love to be able to make chocolate peanut butter pinwheels, but I have had no luck. 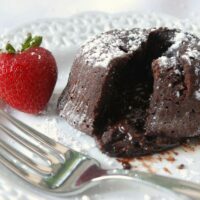 After the recommended waiting period, 30 min., the chocolate becomes very hard to cut but the dough is still very soft. As a result I cannot slice the roll. 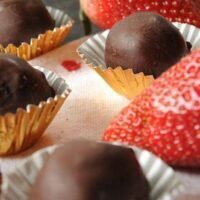 This recipe calls for 6 oz of chocolate which is a whole lot better than the recipes that call for 12 or even 16oz. What am I doing wrong??? 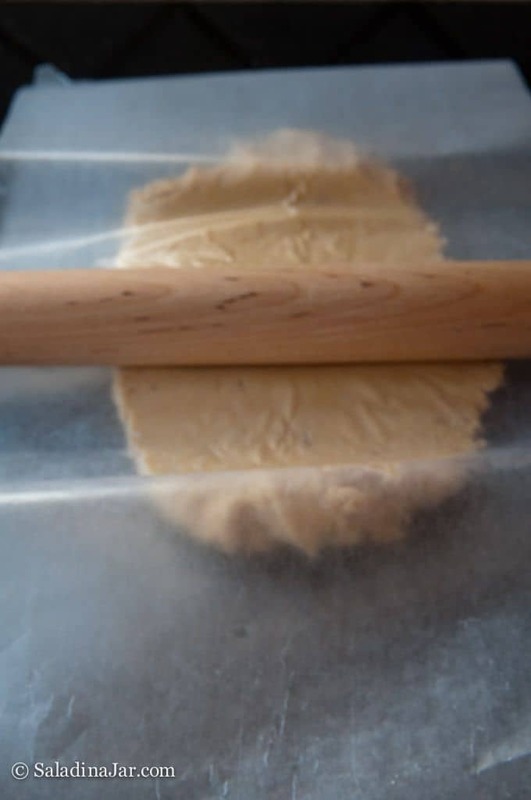 Yes, the dough will still be somewhat soft. You might try the freezer for a few minutes. My other tip is to use a very sharp serrated knife to cut the slices. Let the knife sit in hot water a few minutes to heat it up and cut through the chocolate easier. I will admit this part is a little tricky but practice helps. This looks like a fun cookie recipe that I’d like to try. One question though. Is that 16 oz. of semi-sweet chocolate or 1(one) 6 oz. package of semi-sweet chocolate as in a package of chocolate chips? These cookies are absolutely gorgeous looking. 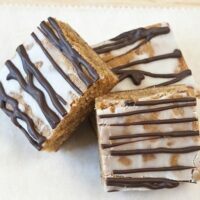 Combine that with the fact that it’s my absolute favorite flavor combination….these are definitely going on my do-bake list! I know two little girls who would think I was the coolest thing ever if I made these. We spent many an evening with Scrabble too, and just as you, are continuing the tradition with Words With Friends. What a priceless picture of you and your sister! My sister was quite a bit older than me, so she definitely had the advantage way back when. I like to think I can give her a run for her money now though. 🙂 Those cookies look absolutely wonderful- Chocolate and peanut butter are the best, aren’t they? Love that you and your sister are continuing your love of word games via cyberspace! Cute picture from *back in the day* too. 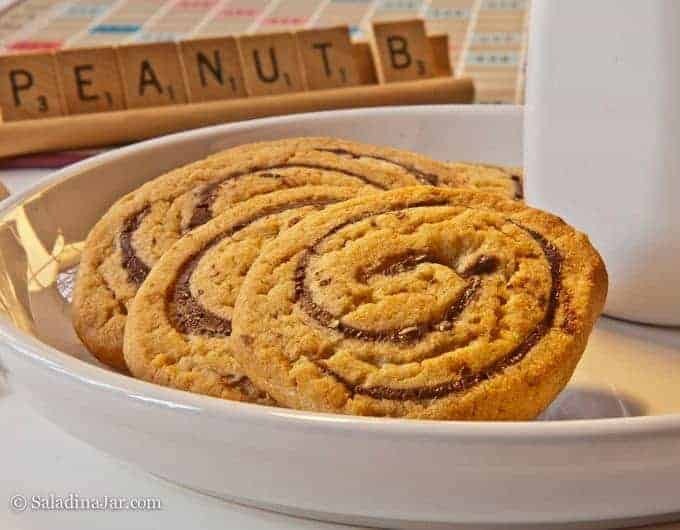 The chocolate PB pinwheels looks delicious. A must save and try recipe for sure. 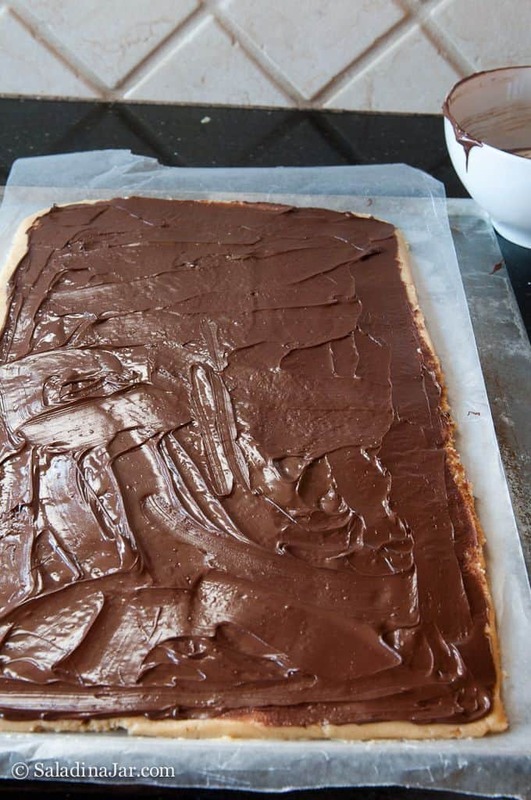 Oh dear… this recipe looks dangerously delicious. Love the photograph! Isn’t it wonderful to have memories like these. What a great idea! So many people, including me, love the peanut butter/choc. combo. Cute photo–reminds me of playing cards endlessly with my older sister when we were kids. That first picture with the Scrabble prop in the background is worthy of a prize! 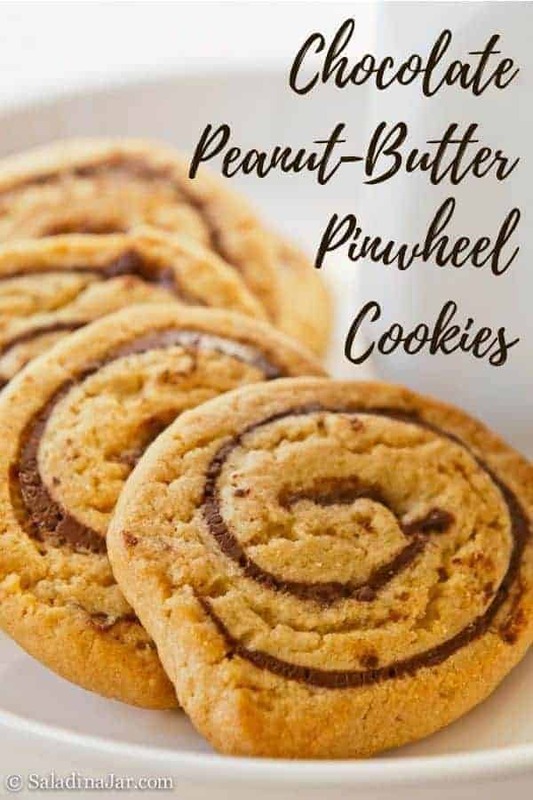 This pinwheel recipe sounds so good! I really enjoy looking around your blog, have a great weekend! This recipe couldn’t look or sound better! I have a love of peanut butter cups too!